December 19, 2017, 1:04 PM · "Harry Detwiler. 1998-2017. 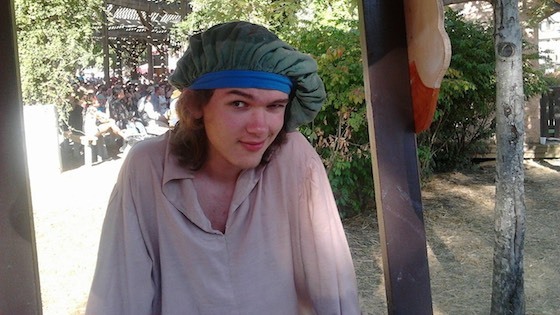 Rest in Peace, my beautiful son. I will love you forever." I saw this post by Isabella Detwiler on Facebook and that’s how I learned of Harry’s death. I taught violin to Harry when he was eight to eleven years old. I haven’t seen him since then, and he recently died at age 19. We are accustomed to seeing the deaths of people older than we are, but the death of someone much younger is entirely different. This is especially true when the younger person died because of something other than natural causes, as was Harry’s case. I’ve heard that teachers live on in their students. What happens when the student is the first to go? Harry was one of my very favorite students. I really loved that little boy, and he loved me, too. He was smart, very talented, imaginative, spontaneous, and very much his own person. He was inventive and surprising. I didn’t love him because of these traits. Love is not, or should not be, dependent on talents and accomplishments. These are simply traits that made him lovable to me. Harry once told me, "One of the reasons I love playing the violin is that it’s something I can do well even though I’m a kid." He certainly did play well. Sometimes he would show me a piece he had been practicing and say, "I don’t like the way this piece ends." I’d answer, "OK. Write your own ending," and he’d do it right on the spot. He always did it well. I’d use his creation to teach him some of the basics of music structure and composition. One day his father, who played guitar, joined us for a lesson and the three of us played together. His father and I, both Beatles fans, played a lot of Beatles songs and talked about them. At his next lesson, Harry marched over to my music stand, picked up my Beatles songbook, flipped through it found what he wanted, and told me, "I want to learn to play this one." It was Yesterday. This is one of the first Beatles songs I usually teach to my students. It is relatively easy, for a Beatles song, and very pretty. Harry picked it up quickly and did it justice. Over all he was a joy to teach. Harry was last seen in May of this year. In late November a dog walker found a collection of human bones in a shallow grave about 15 miles from Harry’s home. The police examined the bones and concluded that they were Harry’s. I shudder to think of how Harry was abused before he died. I really don’t know how to deal with my emotions regarding Harry and his death. The obvious thing to do would be to play my violin, but I recently injured my left arm, and it will be weeks before I can play again. I have been lighting candles for him and now I’m writing this. Good night, sweet prince. May hosts of angels sing you to sleep. December 19, 2017 at 08:13 PM · What a poignant memory. I am so sorry for those who must suffer Harry's loss. My heart goes out to you and to his family and friends. December 19, 2017 at 09:21 PM · Thank you so much, Krista. December 19, 2017 at 09:23 PM · What a sad story. Thank you for lovingly sharing his memory with us. Blessings to you and to his family and friends. I hope there can be justice for him in this world or another. December 20, 2017 at 12:10 AM · Thank you, Karen. You are very kind. December 20, 2017 at 12:39 AM · What a wonderful experience you had working with Harry. I'm sure it was one of the most meaningful things for each of you. I'm so sorry for his family's loss. December 20, 2017 at 01:14 AM · I am so sorry for your loss. He will now live in our memories as he does in yours. When I hear of a young person's death then I know the earth is a little dimmer but The heavens a little brighter and love transcends them both. December 20, 2017 at 01:27 AM · Thank you, Paul. December 20, 2017 at 02:04 AM · Oh, Pauline, my heart breaks for this young man and his family. But what a wonderful tribute to remember him and the joy he got from playing his violin. When your arm is healed, you will play"Yesterday" and it will make a difference. December 20, 2017 at 02:30 AM · Pauline, you had me in tears (really) and then in anger. Karen, the forces of law and order are not able to do justice for Harry, and even if they were able to do all that is humanly possible, it still would not be full justice. However, full justice for him certainly either will be done in and for eternity, or, in the unlikely event of his killer ever coming to a genuine repentance and faith in the Lord Jesus Christ (something you are almost certain to hear about if it ever happens), was done at the cross. December 20, 2017 at 09:12 AM · Pauline, this is heartbreaking. I can imagine that as teacher you often wonder what will become of the little person making their first steps on the violin. This is not how it is supposed to be, not for his poor family not for you as his teacher. And yet, that loveable boy of once seemed to have grown into a fine young man whose life had meaning and who continues to touch peoples' lives. Thank you for sharing your memories with us. December 20, 2017 at 12:19 PM · Words cannot express the loss of someone taken from us. You wrote a beautiful tribute. Warm, loving thoughts to you and my deepest condolences for you and Harry's family. December 20, 2017 at 05:17 PM · I am deeply touched. Everyone has already said the rest. Thank you Pauline. December 20, 2017 at 09:23 PM · Thank you all so much. Sharing and understanding my grief has helped me a lot. Thanks also for reminding of the joy I helped bring into Harry’s life by teaching him to play the violin. December 20, 2017 at 10:06 PM · Thank you for sharing this story. I knew Harry in his later teenage years; it was nice to read about your experience with him when he was a bit younger. He was one whip-smart kid! December 21, 2017 at 09:05 AM · "One of the reasons I love playing the violin is that it’s something I can do well even though I’m a kid." Very poignant, Pauline. As a teacher, I understand how you feel. I'll light a candle in church. December 21, 2017 at 05:54 PM · Thanks, Bill. Never having experienced the beauty of your teaching in my over 50 year teaching journey, I'm deeply moved by your extra special talents as Harry's violin teacher, and greatly encourage you to submit your resplendent Tribute to Harry to ASTA for publication in the next AST Journal, 2018 ~ Please ring the National ASTA Headquarter's and request speaking to Monica Schultz, new CFO of National ASTA, using my name, "I.D. 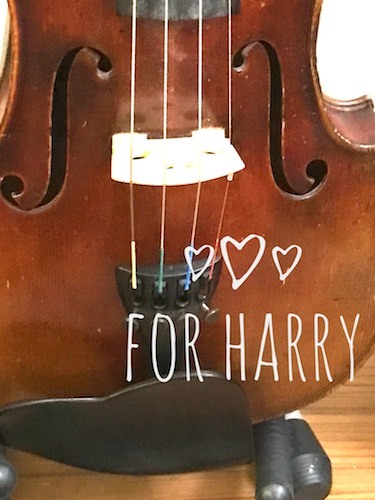 ", (daughter of late National ASTA President, Ralph Matesky ~ Violinist, Elisabeth Matesky), when making that call to: 1-703-279-2113, located in Fairfax, VA.
With tears and profound sympathy to you and Harry's Family, write an ending Harry would like!